Black walnut trees (Juglans nigra L.) make beautiful shade trees. They also provide plenty of pleasant tasting, if messy and hard to crack, edible nuts as well as a highly valued hardwood lumber. But black walnut trees are not always good companions in the garden and yard. In fact, they can be toxic to nearby plants. Very often, when sensitive plants are grown near the roots of black walnut trees, the plants die. Why are Black Walnuts Bad for Other Plants? Black walnuts contain a chemical called "juglone" which can be allelopathic to other plants. According to Purdue University Cooperative Extension, "Juglone has experimentally been shown to be a respiration inhibitor which deprives sensitive plants of needed energy for metabolic activity." What that means to gardeners is that many plants growing in the vicinity of a black walnut tree will either be killed or will struggle to live, with yellowing, wilting leaves. What Part of the Black Walnut Tree is the Problem? 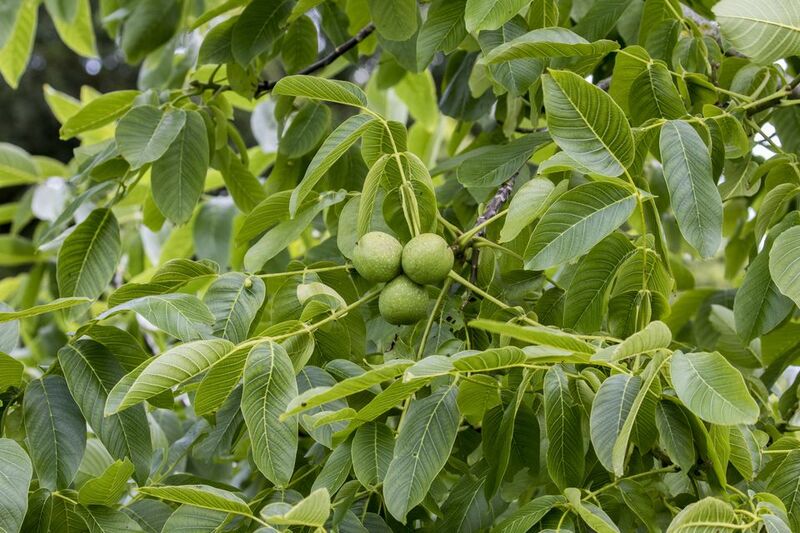 Juglone is found in all parts of the black walnut tree, but it is most concentrated in the flower buds, nut hulls, and roots. Unfortunately, the roots of a black walnut can extend 3-4 times the diameter of the tree’s canopy and squirrels and other animals will disperse the nut hulls across an even more far-reaching range, so the area affected is quite wide. Toxicity is further dependent on the soil’s texture and drainage. Which Plants are Sensitive to the Juglone from Black Walnuts? Definitive testing has not been done and the effects can vary from soil to soil and plant to plant. Juglone sensitivity is also dependent on other growing conditions and what will or won’t grow under one black walnut tree may be fine under another. So it's hard to say for certain which plants will be affected and which will be fine. However, tomatoes seem to be the most sensitive to growing under black walnuts. Here is a compiled list of more flowers and vegetables that are considered extremely sensitive to juglone. Michigan State University Department of Horticulture has an extensive list of trees & shrubs that won’t grow near a black walnut. What Plants Can I Grow Under a Black Walnut? The list of plants that aren’t sensitive to juglone is longer than those that are, but there are always variables and if a plant near your black walnut looks stressed, it’s worth considering relocating it. For a list of juglone tolerant plants refer to the University of Wisconsin’s Urban Horticulture site. Is the Problem Solved When I Remove the Tree? Juglone toxicity can remain in the soil for several years, especially if the roots are not removed along with the tree. Plant as far away from your black walnut tree as possible. If you choose to plant near the tree, your best bet is to create raised beds with some type of screening on the bottom, to prevent invasion by black walnut roots. Also be careful that nuts and debris from the black walnut tree don’t accumulate on the raised bed. As an added precaution, make sure the soil in the raised bed is well draining. Good drainage seems to lessen the effect of the juglone. Can I Compost Black Walnut Leaves? Although the breakdown of juglone can take months in the soil, when black walnut leaves are composted, they tend to degrade within 2 - 4 weeks, depending on their exposure to water, air and soil organisms. Still, it’s recommended that you compost these leaves separately and not use the finished compost on extremely sensitive plants, like tomatoes. Is the Black Walnut the Only Tree I Have to Worry About? All walnuts produce some juglone, as do the walnut relatives bitternut hickory, hickory, pecan, and shagbark. However the amount of juglone produced in these trees is insignificant, compared to the black walnut, and the effect on other plants is minimal if any. It is more advisable to use caution when purchasing other varieties of walnut trees that are grafted onto black walnut rootstock. Horses have also shown sensitivity to black walnuts when the chips or sawdust is used for bedding material. Both horses and humans can be irritated by black walnut pollen, which is present in mid-Spring.